A Day Late and A Dollar Short: Groupon - ATL - Talladega Superspeedway - Dale Jarrett Racing Adventure - 41% Discount! Groupon - ATL - Talladega Superspeedway - Dale Jarrett Racing Adventure - 41% Discount! Those of you who know me well, know that my nickname is "Brown." 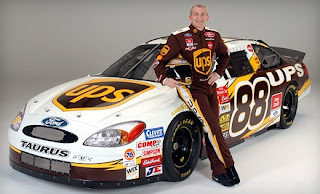 It came from being an avid fan of this man, Dale Jarrett, who for many years drove the UPS car in Nascar's Nextel Cup series. You know..."What can brown do for you?" So tonight, I was excited to see Dale's Racing Adventure at Talladega Superspeedway being offering as one of Groupon ATL's deals! Here are the details, and if you've never done one of these racing experiences before, I highly recommend it! Racecar driving, like reading, dating, and testifying in front of a grand jury, is most exhilarating when experienced at high speed. Jolt your adrenaline with today's Groupon: for $115, you get a four-lap ride-along racing experience from Dale Jarrett Racing Adventure at the Talladega Superspeedway (a $195 value). Riders must be between 5-feet and 7-feet tall and weigh between 100 and 350 pounds. The Talladega Superspeedway is one of the world's fastest racetracks, where drivers navigate 2.66 miles of oval at rates of up to 165 mph. Slip into a fire-retardant racing suit, a full-face helmet, and a five-point harness before strapping into the passenger's seat of a Sprint Cup or Nationwide series stock car with a professional instructor. Each four-lap racing experience simulates a qualifying run as drivers zip down straightaways and fit around curves more tightly than a checkered-flag unitard. Dale Jarrett Racing Adventure boasts a high-society roster of cars purchased from Mark Martin, Bobby Labonte, and other speedy mainstays. Many exhibit varying degrees of acceleration to meet the needs of all driver-rider teams. When finished speeding down a raceway lined with enhanced barriers and retaining walls, slow down to stroll through the International Motorsports Hall of Fame, open daily and located adjacent to the Talladega Superspeedway complex. This is a great deal! It's rare that you see deals or coupons for the racing adventures around the country. To take advantage of this one at Talladega Superspeedway, visit the Groupon ATL website! Hurry! There is only one day left for this deal! I can't get one no more , the time is up I think. Isn't it ? I think I should get one the next time around. Looking forward for the next racing adventure.